This article is a small interlude in my my discussion of post-Keynesian inflation theories. The first article was unfortunately theoretically negative - it discussed the reasoning behind the post-Keynesian rejection of mainstream inflation theories. The next article in this series (not guaranteed to be my next article) will be more constructive, as it will outline the inflation theory discussed in Marc Lavoie's Post-Keynesian Economics: New Foundations.However, I realised that there are some apparently simple concepts that can trip us up before we get to Lavoie's explanation: it is a somewhat advanced textbook (senior undergraduate/post-graduate level) and it does not cover points that someone without a economics background might trip up on. In the previous article, I noted that I am deeply unhappy with reduced form inflation models. (Reduced form is jargon that just refers to mathematical models that are relatively simple to write out; however, it does not mean that the actual solution method is simple.) Meanwhile, Lavoie's text jumps to discussing reduced form post-Keynesian models, which I am relatively happy with. This article provides a bridge to explain what might appear to be an obvious inconsistency: I sneer at conventional reduced form inflation models (which are not just "mainstream"), but I have no issues with the post-Keynesian variants, which appear just as open to the same sorts of criticisms that conventional inflation models face. The key is how the models are used. One bit of background knowledge is the post-Keynesian distinction between flex-price markets and administered prices. Flex-price markets are things like financial and commodity markets. Prices seem to mechanically set as a result of supply and demand; the fact that high speed algorithms have taken over trading is a sign that price formation is in some sense mechanical. (However, this is not true of all financial markets; although I was never a trader, I once got dragged into a week-long discussion with a thick-headed (or abusive) counter-party refused to accept that his price quote was 100 basis points off market. It took a week since we were in different time zones, and no way was I getting up at 1 AM to negotiate with that dimwit.) For free-market oriented economists, flex-price markets are the ideal, and all price setting is an approximation of that ideal. For post-Keynesians, flex-prices are a special case, and will only affect some portions of the CPI. (As noted in my previous post, I believe that if we are going to model CPI inflation at all, we need to decompose it.) Gasoline prices (in the developed countries that I am familiar with, at least) are a component of the CPI that is closest the flex-price ideal. For the rest of the CPI, most prices are administered. Human beings set prices based on a variety of considerations. Although profit maximisation is presumably the ultimate objective, how that is achieved is somewhat open-ended. A good example is the loss-leader, such as the price of Costco hot dogs, which have not moved since 1985 (link). Obviously, the price of hot dogs in a retailer's food court is not going to sway the national price level, but it illustrates how price setting can be arbitrary. 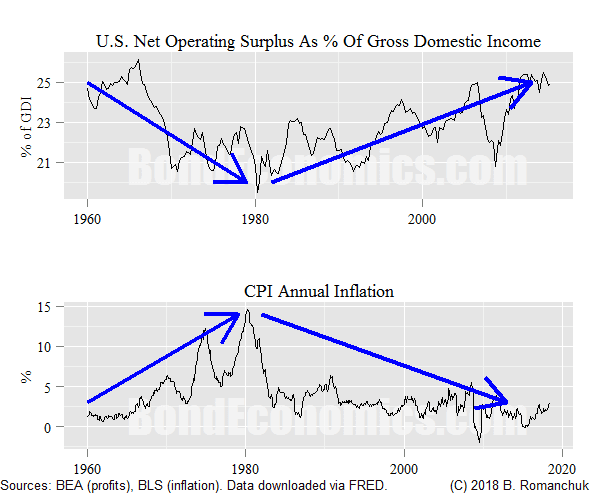 Although I am not a fan of various output gap formulations, I grudgingly accept that supply and demand matter for the determination of the CPI. The issue is the human element -- we need to get humans to change prices, and what they react to will change over time. Based on my experience, Canadians in 2018 think about prices very differently than they did in 1978. This dooms any particular mathematical formulation of the output gap. In the developed countries, demand normally matters more for the cycle than supply. Even with just-in-time inventory management, stores and warehouses are chock full of inventory. (Natural disasters upset this arrangement.) Sellers base pricing on what they think buyers can pay, as well as their own cost of goods/services sold. the estimate of their future income, which feeds into how much credit they have available. Some economists argue that you need "money" to make a purchase; like most grownups I have not needed "money" to make purchases ever since I got a credit card. Income determines demand, hence income is related to price changes due to demand changes. Within modern conventional economics, there is an aversion to discussing the division of national income. (Back when economics was "political economy," this was not the case.) Standard mainstream models assume that wages and prices are determined by marginal considerations, and so the ratio between wages and prices is fixed by the shape of the production function. Conversely, post-Keynesian economics is entirely based on wage and profit shares. Although I did not discuss pricing in the articles, I would refer the reader back to my (three part) primer on the Kalecki Profit Equation (link). We will discuss a very simple economic model, in which there is just a business sector and a household sector -- with the household sector decomposed into workers and capitalists. $(100-x) paid as dividends to capitalists. Profits are equal to the dividends paid. One may note that the level of x is not fixed; all we can say is that it presumably bounded by $0 < x < $100. We now turn to prices. Let us assume that there are 100 workers, and they can produce 100 units of goods in an accounting period. If nominal revenue is $100, then the price per good is $1. If the profits are $20, the implication is that wages are $80, and so the wage is $0.80 per unit of good; each worker can buy 0.80 units. The remaining 20 units are purchased by the owner of the firm with the $20 in dividends. If wages rise to $0.90 per period and we transition to steady state, we see that workers will purchase 90 units, and by implication, only 10 units are left to be bought by dividends. Wages rising faster than selling prices reduces profits. If the selling price is raised to $1.10 per unit, with wages unchanged, workers can only purchase 72.73 (rounded) units; the remaining 27.27 units are purchased via dividends. In other words, the ratio of aggregate wage rates and aggregate prices are related to the distribution of national income. I discussed this in one of my first articles (link). What many people think of as inflation -- a proportional rise in both wage rates and CPI -- is viewed a somewhat special case. as It certainly happens in an economy with widespread indexation, but one might debate how much it matters. We certainly saw a shift in wage shares during the inflation/dis-inflation cycle in the United States (above). Post-Keynesian inflation models are generally built around the wage/profit share split; workers want raises, and firms raise selling prices to preserve profit margins. In my view, these models are largely descriptive; generating predictions with them is obviously difficult. How can we measure the concept of "worker bargaining strength?" We can come up with a host of qualitative measures, but it is going to be very difficult to use them to predict average wage changes within ten basis points. If one is forced to come up a mathematical inflation model, one is largely stuck in the situation of trying to extrapolate the current economic environment forward. We know that things like "worker bargaining strength" is the real variable driving prices, we just have to rely on other variables as proxies to the concept. To what extent other reduced form models are not worthless, they are acting as useful proxies for what we would like to have. However, past performance is no indicator of future results, and if we want to do things like long-term inflation forecasts for actuarial purposes, we need a better handle on what changes to look out for. I hope to continue with a summary of Marc Lavoie's description of post-Keynesian models in an upcoming article. * This is not to say that we cannot model some aspects of human behaviour. In the field where I used to be an academic -- control systems theory -- there were perfectly adequate models of pilot reaction time. These models had to be used, as a plane that resonates at the wrong frequency will fall prey to pilot-induced oscillations. What happens is that the natural reactions of the pilot will destabilise an otherwise stable plane. In order to stop the plane from bucking, they need to let go of the flight stick, which is not what pilots normally want to do in a crisis. The wrong reaction by the rider can make the oscillations worse, via positive feedback instead of oscillation damping, sometimes causing a crash. Great post, great examples (Costco, pilots etc). #1 The Profit Theory is False Since Adam Smith. What About the True Distribution Theory? #2 Ricardo, too, got profit theory wrong. Sad! Fine. When you can convince the accounting profession that paying dividends is an expense, I’ll re-write my text. Deal? I wonder, what makes you think that my mission is to convince economists in general and you in particular. The representative economists is a failed/fake scientist and has to be expelled from the sciences as fast as possible. His final resting place is the farthest corner of the Flat-Earth-Cemetery. My mission is NOT to convince you of anything but to prove that you are too stupid for the elementary mathematics that underlies profit- and distribution theory. If there were profit sharing arrangements with workers, then how might that affect inflation? I'm thinking of the John Lewis Partnership in the UK that is entirely employee owned such that all profits also go to workers as a bonus to the fixed wages they get. There is talk of greatly extending such arrangements as a political policy in the UK. Good old John Lewis; I liked shopping there. The profit sharing arrangements would have to be extremely widespread for them to show up in the data. If we assume that there are no strikes for higher wages, the PK emphasis on income distribution would not be helpful. The only reasons to raise prices would be because of rising demand leading to shortages and opportunistic price hikes, as well as rising input costs. PK theory would suggest that inflation would be more stable; but we would not know unless it happens. For the case of the investment economy, the Profit Law reads Qre=I−Sm which is known since Allais.#3 Qre is macroeconomic retained profit. Just in case you and Brian Romanchuk start to wonder why you are so badly behind the curve, the problem is NOT in economics but in your goldfish brain and the corresponding complete lack of scientific competence. Yeah, that’s right, I forgot what a relable source you are. My bad. It's encouraging to hear that profit sharing might be a way to avoid having accelerating inflation as a consequence of increased workers' bargaining power. I guess we'd just need to have Unions agreeing to strike for increases in % profit share rather than increases in basic pay. A couple of years ago I asked Nick Edmonds a similar question on his blog but back then he wondered whether wages acted as a nominal anchor on the price level and so reducing the relevance of wages might actually let inflation take off more (I hope I'm not misreporting his answer). PS -Egmont Kakarot-Handtke, I'm certainly very far from being an economics researcher, I've not had any economics education; I'm just a interested observer. It is too obvious that you are a fake mathematician. A genuine mathematician does not care at all about “reliability” or “credibility” or other subjective social criteria but alone about objective proof. (i) The equation Qre=I−Sm is logically true given the correct macroeconomic axioms and is objectively testable because all variables are measurable with the accuracy of two decimal places. According to Wikipedia, Allais was a major proponent of mathematical economics and as a winner of the economics Nobel in 1988 he certainly satisfies your standard of “reliability”. So, what you would have done as a genuine mathematician is to check the references and to do a little elementary algebra. Fact is that you are a scientifically incompetent blatherer. (1) I have a real academic training, and as an applied mathematician, I am aware that definitions matter. You chose a nonsensical definition of profits, and end up with gibberish. (2) Although I have been patient with you, I suggest that you give this article a rest. Please wait until I write another article before regurgitating your stories. Like I said, give it a rest. And to respond to your deleted rant: I already read your theories, and explained multiple times why you are wrong. Feel free to go back and consult what I wrote.